How and when should you fertilize your Illinois trees? Find out below in our latest blog! Are you dreaming of healthy, fast-growing trees on your property? 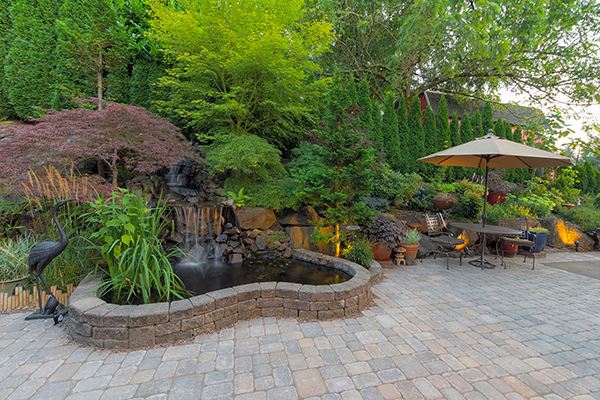 As a homeowner, you’ve likely already got enough on your plate when it comes to landscaping. However, trees require just as much care and attention as shrubs, lawns, and vegetable gardens. In fact, it’s imperative to regularly inspect the health of trees you’ve planted on your property. Tree transplants are especially vulnerable to slow growth given their need to adapt to new soil, weather, and plant neighbors. We recommend fertilizing your trees to promote a happy tree existence. In this post, we’ll discuss when to fertilize trees, how to do so, and what fertilizers you should utilize. Read on or Watch our latest video below for more insight! What nutrients are in tree fertilizer? Fertilizer is a substance designed to promote healthy plant growth. It is either mixed into the soil directly or applied as a surface-level additive, designed to boost soil fertility. Most fertilizers are rich with nutrients and other additives that encourage and enhance plant growth. Many fertilizers include macronutrients, the building blocks of a plant’s nutritive needs: potassium, nitrogen, and phosphorus. Others may include traces of other minerals, such as zinc, copper, calcium, and magnesium. Fertilizer can be incredibly helpful for plants that live in more challenging climates. It can also transform less friendly soils into the type of nutrient-dense soil your plants crave. Tree fertilizer is specifically designed to help you foster beautiful, leafy, healthy trees. 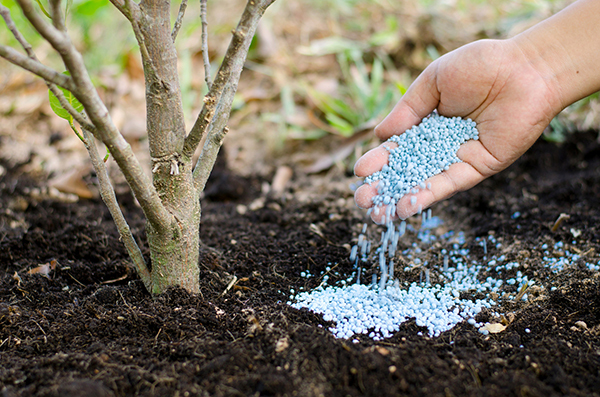 Fertilizers will vary depending on the type of tree, nature of your soil, and climate. In general, however, most tree fertilizers will contain those macronutrients most forest dwellers already have in abundance: potassium, nitrogen, and phosphorus. These can be valuable for trees that are planted directly into lawns, far from a nearby forest or grove. We recommend incorporating fertilizer into your routine care regime for all of your trees, particularly those that are currently living on lawns or in fields. Doing so can ensure that your trees are getting the nutrients they need instead of passing these along to grass and other shrubs. Fertilizer can also combat the nutrient loss that often results from raking and clearing. Removing debris from the base of trees may look nice, but it’s actually taking away from your tree’s mineral and vitamin needs. There are endless types of tree fertilizers out there. Where do you even begin? The first place to begin when looking for the best tree fertilizer is the fertilizer’s nutrient make-up. We recommend starting with fertilizers that have, at a minimum, those macronutrients that trees love so much (potassium, nitrogen, and phosphorus). 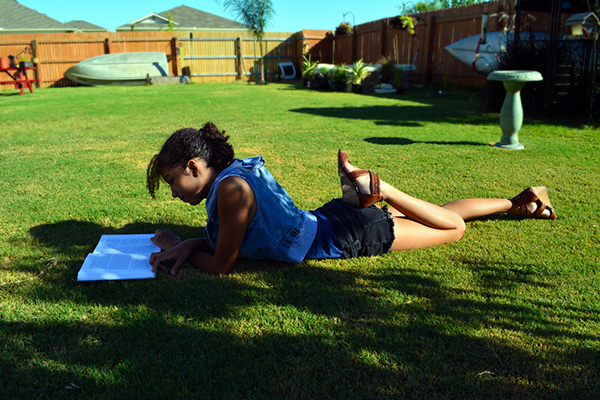 Other fertilizers may pack in additional minerals, such as magnesium or calcium. It may be best to test out your soil before selecting a fertilizer for your trees. You can easily take a pH test, for example, to determine your soil’s acidity. Soils with higher or lower acidities may require specific nutrients to promote plant growth. You may also wish to contact a local arborist to get a professional assessment of your soil quality and needs. The tree experts at Hendricksen Tree Care can offer you the knowledge you need when it comes to tree fertilizers, too! The better tree fertilizers will ensure that trees receive nutrients slowly and consistently over a long period of time. Prioritize fertilizers that are “slow release” in this way. Many tree fertilizers have other chemicals in them designed to boost tree growth. If you choose a fertilizer with such chemicals, look for one that has a “low burn,” meaning that chemicals aren’t likely to burn or fry exposed roots and limbs. It may be helpful to prioritize tree fertilizers designed for specific kinds of trees. If your property is home to many aspen trees, for example, look for fertilizer mixes designed to promote aspen growth. These are likely to contain high concentrations of iron, as some aspens can fall prey to iron deficiencies if planted in the wrong climate. These types of fertilizers are especially important if you’ve planted trees that aren’t entirely comfortable with your current soil make-up or climate. If this has happened to you, don’t worry–many homeowners have done the same! If you are unsure about whether or not your soil or climate suits a specific type of tree, contact a local arborist or an expert here at Hendricksen Tree Care. Doing some online research about tree preferences can also be valuable here. In general, mulch is valuable for trees that have been newly planted–and trees that need an extra bit of seasonal love. In addition to the fertilizer you choose, we definitely recommend bringing in a serious amount of mulch. 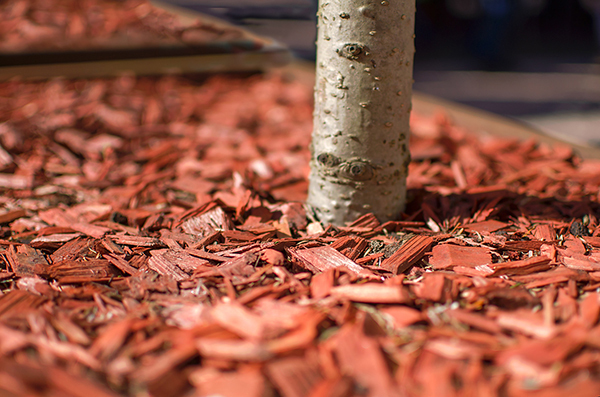 Mulch is made up of decaying substances trees love, such as leaves, bark, and compost. When spread around the roots and base of trees, mulch can insulate soil, keeping it at a temperature your trees love. It can also help trees retain water, which is central to your trees’ ability to produce chlorophyll and to ingest nutrients. Lastly, mulch can ensure that your trees are getting all the nutrients you’re feeding them–instead of other plants sneaking in some bites! Mulch prevents weed and grass competition and can also contribute valuable nutrients to the soil itself. Whatever fertilizer you choose for your leafy groves, be sure to invest in some mulch. This is essential if you have just planted baby saplings, too, as these are in the greatest need of water and nutrients. 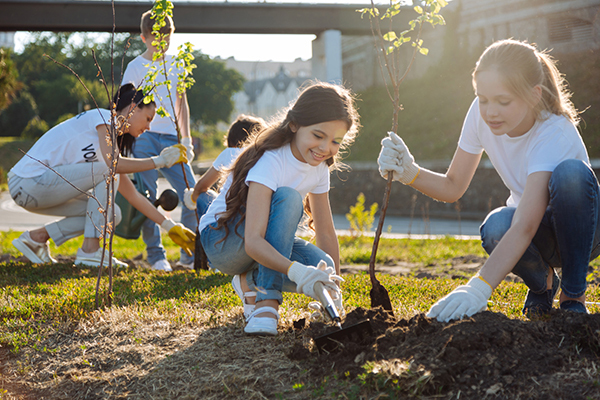 You can enjoy gardening and minor tree care such as mulching and fertilizing with your entire family, make a fun filled day out of it! The way you fertilize trees will depend on where your trees are located and what fertilizer you are applying. Most fertilizers can be spread comfortably about the base of a tree, much as a homeowner would apply mulch. Others, however, may be more effective if “injected” into the soil. This is often the method used by professional arborists or on tree farms. It involves infiltrating special fertilizer into the soil substrate itself. Still, other fertilizers can be applied in liquid form, particularly when diluted in a bucket of water. Tree fertilizers may also prove effective if in “spike” form. These fertilizers are drilled into the ground around your tree’s root system. Most fertilizers will have application instructions on the packaging. 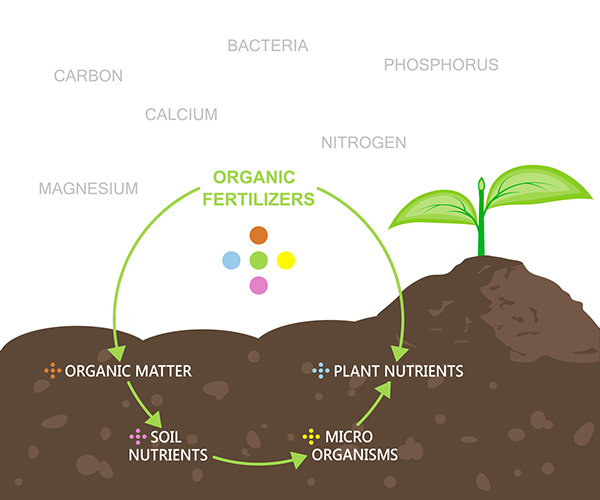 If you get your fertilizer from an organic or local supplier, ask a representative for more information about the proper application. 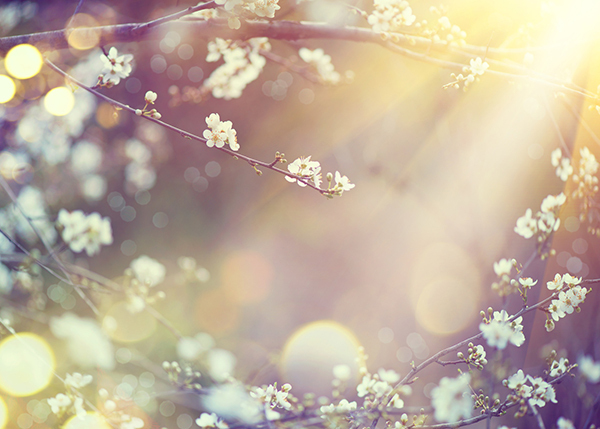 The right tree fertilizer won’t just make sure your trees grow to be tall, leafy, and happy. The best fertilizers for trees will help combat common problems many suburban trees experience. These include dead or dying limbs, slow or stunted growth, minimal twig growth, and small leaves. They can also aid with soils that are substantially lacking in nutrients, promoting water retention and healthy root growth. You may notice that with a regular fertilizer regime, buds and new limb growths double or even triple. Fertilizers designed for certain types of trees can additionally help with species-specific issues. You may find that fertilizers can eradicate the effects of nutrient deficiencies or infestations. A tree that is well fertilized will also have better resistance against harmful insects and disease. Trees that are weak or nutrient deficient are much more vulnerable to these issues. Believe it or not, tree fertilizer can also ensure that your other yard plants get the attention they need. By mulching around your trees, for example, your plants won’t have to “fight” over water. Mindfully proportioning nutrients when taking care of your lawn plants can be vital for all of their individual success and root system development. There are plenty of factors to consider when determining when to fertilize your trees. However, we suggest fertilizing trees in springtime. Whether you choose mid to late spring depends on your region (and whether or not snow is in the way!). Some homeowners find success in fertilizing their trees in the late fall, either in addition to the spring fertilizing or as an alternative. The time to fertilize will also depend on the type of tree you wish to fertilize, your climate, and your trees’ needs. Some fertilizer packages will also specify ideal fertilizing times. If you are confused about when or how to fertilize trees, you can always reach out to our professional arborists at Hendricksen Tree Care. We can recommend that best types of fertilizer and fertilization methods for your specific types of trees. Whether you have just planted some new trees or are looking for ways to keep your current ones happy, be sure to fertilize your plant friends this year. Trees require just as many vital nutrients as the other plants in your yard, and while they can be relatively durable, they sometimes can experience nutrient shortages. Learn more about your region’s climate and your own land’s soil makeup before purchasing a fertilizer that works best for your trees. The best fertilizers for trees are likely to be packed with macronutrients and minerals that certain types of trees crave. Prioritize fertilizers that are slow-release and low-burn, and be on the lookout for ones that are designed for certain species of trees. You can hire professionals to fertilize your trees for you or take it into your own hands. Make sure you follow fertilizer instructions and apply mulch beforehand. You should fertilize your trees in the early fall and late spring for maximum results. If the idea of finding your own tree fertilizer seems a bit intimidating, don’t worry. We can happily assist you in all aspects of your annual tree care, including determining when to fertilize trees! Learn more about the tree care services that we offer here at Hendricksen Tree Care. You can count on our professional arborists to recommend the most effective fertilizers based on the types of trees you have and the condition of your soil, and we also offer fertilization services to fertilize your trees when they need it.